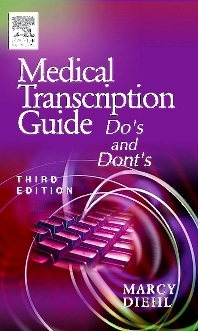 A quick reference for the medical transcriptionist, this book provides basic rules of grammar as well as current trends in the field. It's especially useful in searching for help with an obscure rule or in reinforcing a common practice. Using short chapters, this text provides the Do's — the grammatical rule, its exceptions, and its variations, along with examples; and the Don'ts — any common contradictions of that rule. Examples are taken from medical writing rather than general writing. Easy-to-use format provides numbered topics in each chapter, which are followed by Do's and Don'ts in quick, easy sentences. Spiral binding allows book to lay flat so MT's can refer to a rule without taking their hands off the keyboard. Clear examples are given to clarify difficult-to-understand concepts and rules.